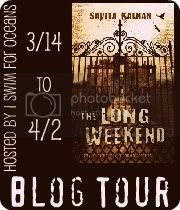 Have you read The Long Weekend by Savita Kalhan?? It's a chilling story about two boys who find themselves trapped in the middle of a nightmare that will keep you turning the pages in fear of what's to come next. The talented author Savita has stopped by GReads to answer a few questions & also present a giveaway for my followers! Hi Ginger! Thanks for inviting me to your blog today. I’m looking forward to answering your questions! With this being your first novel, I read that you stumbled in to writing as a dare. I'm curious, what was the dare? Well, I lived in a country where most books were banned and I used to come back from holiday with books hidden in my suitcase. I was heavily into fantasy epics at the time – and as you know there were sometimes several books in the series! Some of them were brilliant, others were not and after the major effort of getting the books into the kingdom, it was really disappointing. My friend and I dared each other to write an epic fantasy trilogy! We both taught English and devoured books like demons, but neither of us had ever written before. I completed the challenge, but she didn’t write a single word! But my friend did read every single word I wrote! Do you see yourself always writing young adult literature? Or do you feel as though you might venture to different genres? At the moment I’m loving what I do. I love reading teen and YA literature, but I’m a big reader and read as much adult literature. The different genres I read vary widely too. I love crime novels, fantasy epics, and world literature. So I may venture away from writing YA, but I don’t think it will be for long! Of all the places you have traveled to, which would be your favorite spot? Do you have any fun quirks or habits while writing? I tend not to hear anything when I’m working! My son will come and ask me a question and I’m nodding as he’s asking, but at the end of it, I won’t have heard a word he’s said and he knows it! Sometimes I talk to myself, which I know is the first sign of madness, but I can’t help it! I have notebooks dotted round the house – just in case I think of something and I’m afraid of forgetting it before I get to the laptop! I have an enormous collection of notebooks, which came about because I wrote the fantasy epic in notebooks before transferring it to the computer. It’s hundreds of thousands of words long, so I became a notebook collector – I’m always on the lookout for more! When will we see another published book from you? Gosh, that’s a big question! If it were down to me I’d say this year, but being more realistic I’m hoping for next year. It’s a tricky business and so much of it is out of the writer’s control! Thanks, for having me here, Ginger. It’s been fun! EDIT: Winner has been chosen & this giveaway is now closed!!! Please answer the following question in the comments for a chance to win a copy of The Long Weekend! Leave your email address so that I may contact you if you're the winner, thanks. What’s your favorite place to go back to visit - and what book would you take with you? It's always a pleasure to have an author featured here at GReads! Thanks again to Savita for stopping by. Be sure to check out her book & don't forget to answer the question above for the giveaway! Mmmmm I love the ocean so I love going to any place in South Africa (where I live) that has the ocean, especially Hermanus, a coastal town 2 hours from my home. I love taking a book along that I've already started reading and that I'm loving, but I usually take two or three books. Something like a good mystary or drama. I would love to go back to Rome. The book I would bring would be whatever I am currently reading. I'd go back to a enormous park in the middle of Barcelona (next to a zoo, I can't remember the name, very frustrating). It was the perfect day: sunny, warm, awesome green and yellow parrots flying around and sitting in the trees everywhere and me and the boyfriend just read all day, sitting in the shade of a tree. If I could I'd go back and visit that place and day exactly as it was. I'd bring Pride and Prejudice, because it's my favourite book and would make the day even more enjoyable. Only enter me if the giveaway's international! I would love to go back to Paris. And I want to get in those Catacombs! Only one book? Hmmmm.... I would most likely load up my Kindle.... But I'd take something epic, like Pillars of the Earth, or something like that, I think. My favorite place to go back to would be this Greek beach i went to vacation on. It was so nice and peaceful. I would bring a couple of books and my journal. I would go back to where my grandparents used to live where they had a few acres with an oval pond and a wooden bridge built over it. I'd like to actually go back in time and sit there with my grandma just like when I was little. There's no way to choose what book to take... I'd have to have at least one 50 pound suitcase full or a kindle full of books!! I'd love to go back to the height of the Egyptian era. I'd take The Hunger Games with me, so I could learn how to survive! !